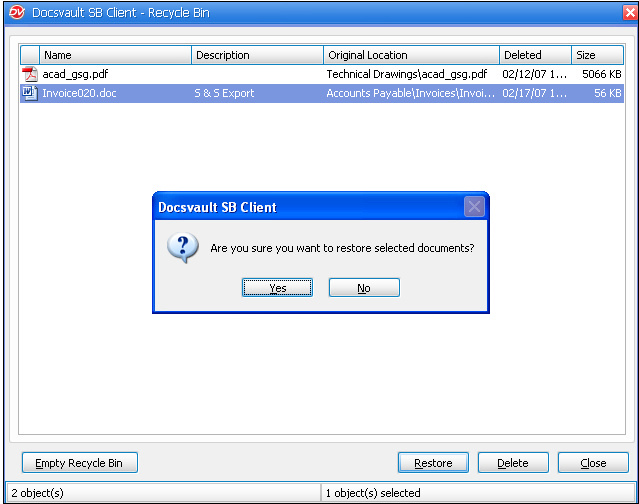 When you delete any files or folders from Docsvault they are placed in Docsvault Recycle Bin. The Recycle Bin provides a safety net when deleting files or folders. If any documents get deleted in error, you can retrieve them anytime along with all their version and profile information as long as they exist in Recycle Bin. To permanently remove files from Docsvault, you need to permanently delete files from the Recycle Bin. You can choose to delete individual files from the Recycle Bin or empty the entire Recycle Bin at once. Users with 'Empty Recycle Bin' system rights can permanently delete the files from the Recycle Bin. •Prior to deleting a document, ensure that it is checked in and is not routed by another user. •Select the documents to be deleted. •On the Edit menu, select Delete or click on icon from the toolbar. •At the delete confirmation message, click the Yes button. •Only the Administrator or the User with 'Overwrite/Delete' rights can delete the folder. •From the View menu select Recycle Bin or click on icon. •This will display Recycle Bin dialog box as shown below. •Select files and folders to be restored and click on Restore button.